Journalist Dhanya Rajendran moderated a discussion with Jairam Ramesh, Member of Parliament and Harini Nagendra, Professor of Sustainability, Azim Premji University. 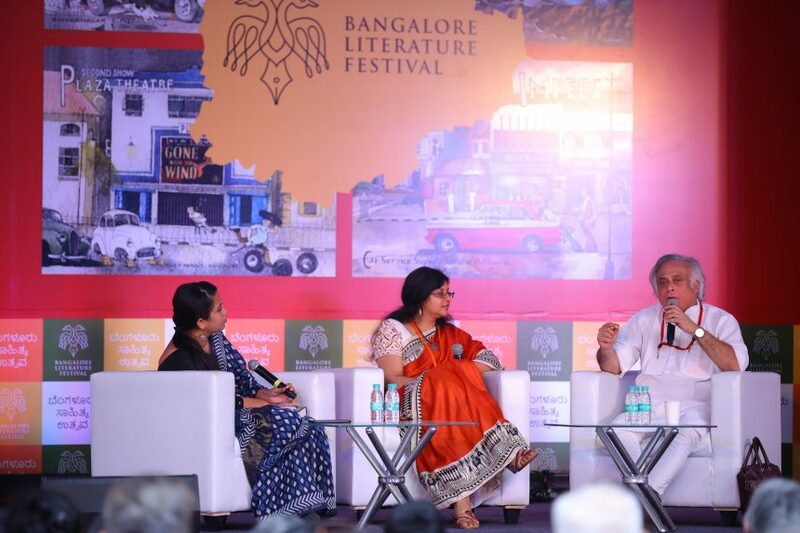 The session was titled ‘Nature and the City ‘ and the discussion was focused around two books – Jairam’s ‘A life in Nature’ and Harini’s ‘Nature in the City: Bengaluru in the Past, Present, and Future’. Jairam’s book ‘A life in Nature’ talks about a lesser-known side of the former Indian Prime Minister Mrs Indira Gandhi. ‘Indira was a reluctant politician but an ardent environmentalist’, said Jairam. Wildlife Protection Act, 1972, Water (Prevention and Control of Pollution) Act, 1974, Air (Prevention and Control of Pollution) Act, 1981 and The Environment (Protection) Act, 1986 have all been brainchildren of Indira Gandhi. She also played a very instrumental role in various environmental projects like the Silent Valley Project, Project Tiger, Chilka Birds sanctuary, Bharatpur Birds sanctuary etc. to name a few. Indira was the first Indian prime minister to begin a discussion on conservation of nature. Indira was the only Indian prime minister who took a personal interest in the environmental protection while all her successors leave it to their Environmental Ministry. Jairam also agrees that Ram Guha was right in calling her a ‘top-down environmentalist’. However, her perspective of conservation also took a positive change after the Chipko Movement, 1973. According to him, the bottom-up approach to environment In India started only after the Narmada project. Until then it was the people with privileges like the Maharajas (who in fact hunted the Tigers in their younger age) were active conservationists. He also explains the challenges of being a politician and how a leader must have the courage to make some tough decisions. He shared some interesting anecdotes about how Indira always quoted from the Vedas when she spoke about the environment. He recalls an incident when she replied to the Swami from Divine Life Society who was concerned about the destruction of Himalayas, with slokas from Vedas. The mention of Swamis saw the panellists digress a little towards Rally for rivers. “Environmental protection has become such a fad these days that everyone wants to jump on the wagon. Nevertheless, such efforts should be welcome and not be given a sectarian connotation although I would prefer the swamis to look at the floodplains first”, says Jairam Ramesh. Speaking of Harini’s book, Dhanya Rajendran explained how Harini has accomplished the tremendous task of collecting the maps of Bangalore city from various time periods. The book is about how the landscape of the city had changed since 6th Century AD and its impact on the environment. Bangalore is a semi-arid area placed on a plateau with no rivers beside yet. So, when the early settlers moved in and formed villages, they planted trees and constructed lakes for water storage. However, when the cars came in, the felling of the trees began slowly. But people are now realizing the impact of the environmental degradation and hence the demonstration of strong citizen activism in the city during the recent years. Speaking of a long-term vision for the city, Harini says, the plans have always been there in the paper. Interestingly the plans always got better over years, but the implementation went from bad to worse. Most environmental projects like cleaning of lakes are approved because they are huge projects and there is a lot of money involved in them. These projects provide the corruptors with an opportunity to loot. She says, when it comes to the environment in urban spaces there has never been a win-win situation. The environment has always lost its battle in cities. When asked if India should look up to cities like Singapore or London or Paris for city planning, Jairam observes that India is unlike those cities. No country in this world is going to be adding so much population as India in the coming years. There is surely no harm in looking for some aspects of these cities but it is important to look for homegrown solutions. We can’t but agree with him on that. About the Author – Jeevanayagi Ganapathy is Founder Editor and Writer at www.bookstalkist.com.